Our Tableware Line includes quality melamine and SAN plastic products, such as Ramekins, Sugar Caddies, Oval Platters, Bowls, and more. 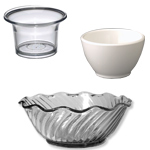 Affordable and highly durable, our Plastic Servingware will reduce replacement costs and improve your profits. For more information on any of our Tableware Products, please contact us at 1-800-233-0828. You might also be interested in our Custom Plastic Glasses, Custom Glass Drinkware, Drink Tokens, and Bottle Openers and Corkscrews.